Thirty-three members of Congress and their immediate family members collected at least $15.3 million in farm subsidies between 1995 and 2016, according to data from EWG’s Farm Subsidy Database. The database, based on records from the Department of Agriculture, shows that of the 32 legislators who received farm subsidies, 31 grow crops that are also eligible for crop insurance subsidies. The farm owned in part by Rep. Doug LaMalfa, R-Calif., received at least $5.3 million in farm subsidies between 1995 and 2016. 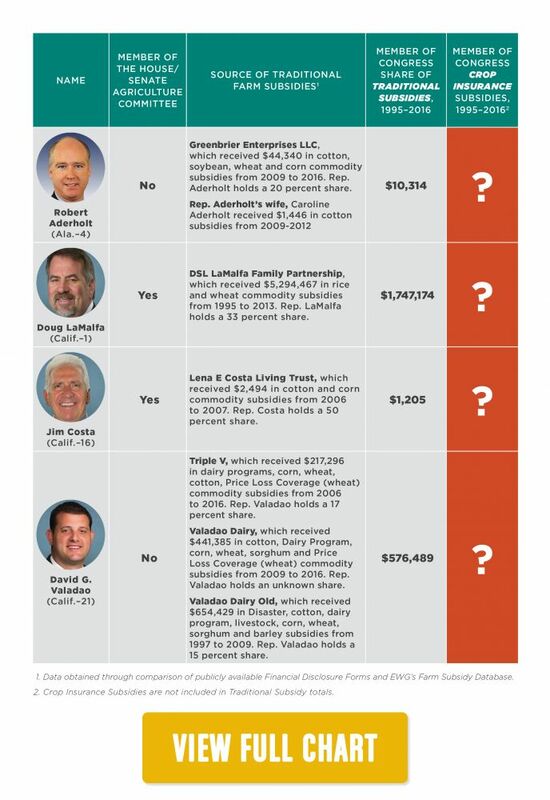 LaMalfa is a member of the House Agriculture Committee, which has jurisdiction over farm subsidies. Other big farm subsidy recipients include Sen. Chuck Grassley, R-Iowa and Reps. Vicky Hartzler, R-Mo. ; David Valadao, R-Calif.; Devin Nunes, R-Calif.; Kristi Noem, R-S.D. ; and Ralph Abraham, R-La. Abraham is also a member of the House Agriculture Committee. Overall, at least seven current members of the House and Senate agriculture committees received subsidies between 1995 and 2016. EWG examined farm subsidies to members of Congress and their immediate families, but not farm subsidies that flow to extended family members. EWG recently updated the Farm Subsidy Database to include data for 2015 and 2016. The Congressional Budget Office recently found that these subsidies cost taxpayers far more than expected when Congress enacted the 2014 Farm Bill. The updated database shows that farm subsidies overwhelmingly flow to the largest farms. The top 10 percent of subsidy recipients collected 77 percent of farm subsidies between 1995 and 2016, even though annual farm household income for very large commercial farms tops $1.1 million. In addition, the data show that farmers in just six states – Iowa, Minnesota, Nebraska, Illinois, Kansas and North Dakota – received more than half of all farm subsidies and crop insurance indemnities. Updated on Dec. 12, 2017. The original report listed Rep. Bill Flores (R–Texas) as a recipient of federal farm subsidies in the amount of $202.00. According to Flores’ office, that is not accurate. Here is a statement from Rep. Flores’ communications director Andre Castro: These farm subsidies were received by an estate/family partnership owned by the Congressman's cousins and siblings. He opted out of receiving his share of the subsidies; and he refunded the payments that the government sent him in error when the government failed to comply with his opt-out application.